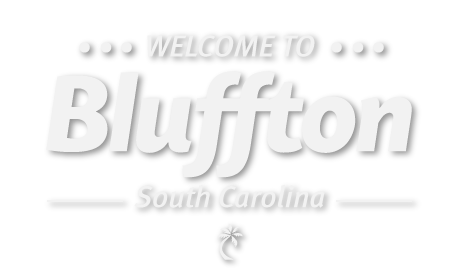 Welcome to the Palmetto Bluff home of Connecticut native, John Howard. So many elements inspire the design of a home: site and natural surroundings, the owners’ dreams, and the imagination of the designer, to name a few. 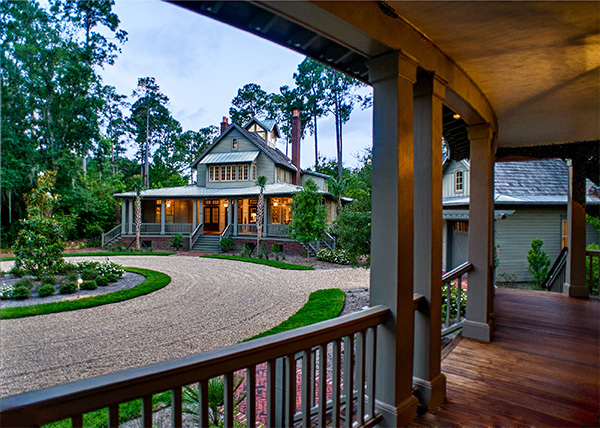 I was pleased when Bill Mischler, exceptional craftsman, master builder and person, offered to show me the Magnolia House, a special house he felt Breeze readers might like. I have known Bill for close to 20 years. He is passionate about his work, family and friends, and has made a permanent mark throughout the Lowcountry, including his work with regional custom homes, the Oldfield Nature Center, the Palmetto Bluff Chapel and the restoration of the 1732 Bonny Hall Plantation in Colleton County, South Carolina. After turning on a dirt road and driving a short distance through flanking arbors, we entered a circular, pebbled motor court, surrounded by buildings arranged in an arc. 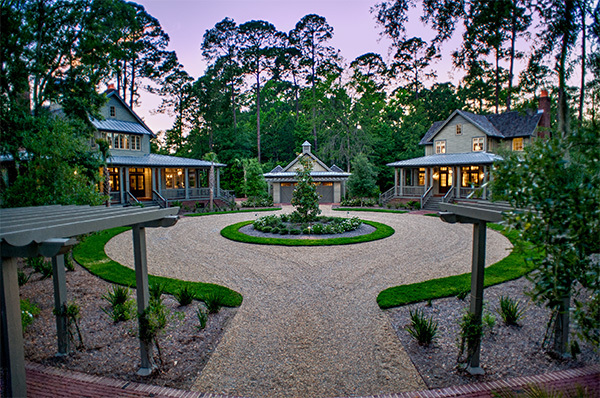 My first impression was one of Lowcountry exteriors complementing the natural surroundings, simple materials and elements and large, stylized overhangs. Built as a compound, the carriage house is in the center, main house is to the left and guesthouse to the right. In somewhat of an epiphany, I realized that the foundations, porches and concave roofs all follow the same radius as the drive and perimeter landscaping. At the center of it all is a young magnolia. Once inside, we see the space’s Colonial influence, evidenced by simple wood paneling and subtle details. It is apparent that John, Geoffrey and Bill (along with another Connecticut friend, Interior Designer Wendy Kirkland of Savannah) teamed together to create something unique. Magnolia House’s exterior is pure Lowcountry, and the interior inspiration comes from New England, representing John’s two worlds—north meets south! The central cupola provides light to a second floor gallery that opens to the ground floor. 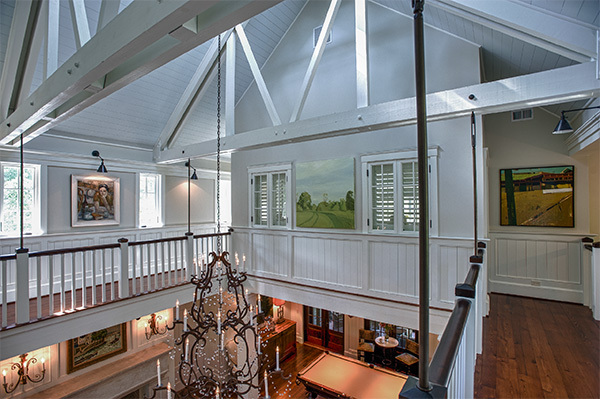 It introduces a “sea captain” element with the painted paneled walls, beaded moldings, “nickel and dime gapping,” beamed ceiling, timber framing, and warm, wide-board pine floors. This design is carried throughout the 3,200-square-foot main house, and the two-bedroom guesthouse. Details abound in a subtle sense of quality. The paneling was painted with a brush, and the trim was sprayed the same color, but the different approaches resulted in a slightly different sheen. Each painting and print was carefully selected, planned and placed. Interior windows allow light into the hall, and the timber framing provides both form and function. Black iron rods that support the gallery beams provide another subtly unifying detail, another example of an element that provides both form and function. The curved roofs, porches and facade of the three structures surrounding the magnolia can best be seen from the guesthouse porch to the main house and garage. Because of the radius, each roof panel, ceiling board and decking board had to be cut at slight angles. Each rafter is a different length, and the roofs are a combination of zinc-coated stainless steel and cedar shake. The siding is shiplap cypress with mitered and joined outside corners. The trim, paint, windows and doors match each component of the compound. Note the attention to detail in the shot to the right—how the beaded parting mull at the transoms, continuing to the paneled walls. Each board is precisely gapped and continuously aligned throughout the room. The ceiling molding is separated from the ceiling with a nickel. This subtlety is a nice effect, but it also keeps the caulking from cracking, as it might if the molding touched the ceiling. All of the panel walls are separated with a dime. As the temperature and humidity of the house changes, older tongue and groove walls would contract and expand at differing widths. Because Geoffrey understands the South, he used these details to keep the spacing and gapping the same, adapting his construction techniques for the change in climate. Small details, like the recessed shoe mold that sits under the baseboard instead of on top; the artwork, fixtures and accessories are all carefully considered. The Sheraton chairs are elegant and their simple, classic design echoes the owner’s taste. There is no clutter, and every space and room in both structures connects, unifying the design with light and natural views. The dining room is flanked by oversized stone fireplaces and light flows in through the gallery and cupola above. The exposed ceiling joist supports the upper floors, and is painted on the bottom and stained on the top. In keeping with the centralism concept, one can see the magnolia tree through the living room, the front door and porch beyond. The design target for the kitchen, as conveyed by Geoffrey, was to create a space where John could both cook and entertain in a setting for guests who could either help or sit a comfortable distance away in the breakfast area. 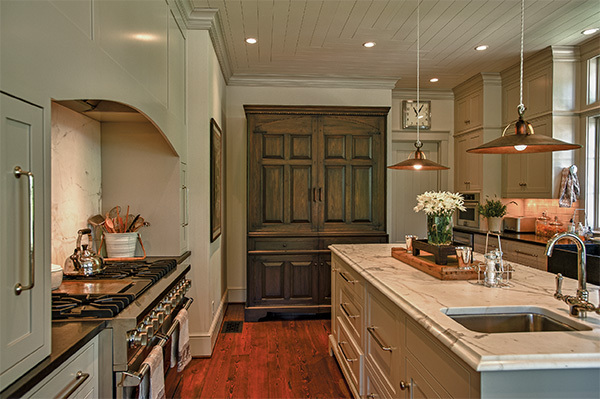 While modern in terms of equipment, he wanted the look to be casual, classic and befitting of Lowcountry style. The best example of this is the custom wood cabinet that hides the stainless refrigerator and freezer. The craftsmanship required to reinterpret a classic antique is extraordinary. The Il Fanale fixtures over the island were selected specifically by Wendy because of their timeless simplicity. 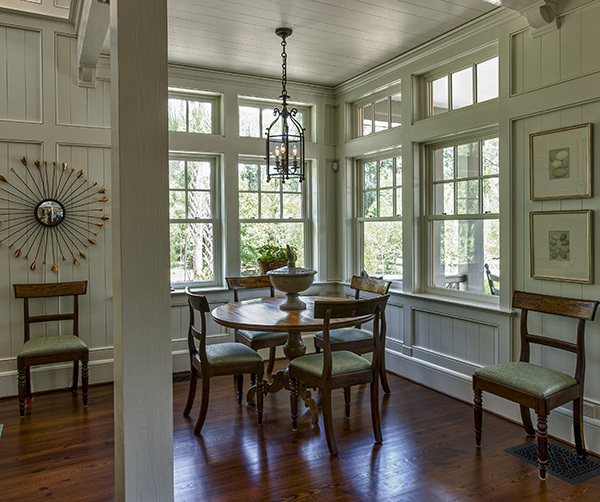 The pattern of the wood ceiling creates a very subtle sense of separation between the kitchen and breakfast area. The guesthouse is the smaller sister of the main house. 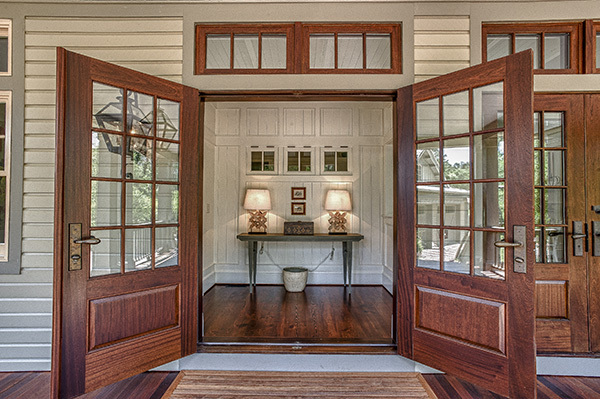 The stained and varnished mahogany entry doors and transoms open into a paneled, small foyer with awning windows that allow interior light into the kitchen, all mirroring the symmetry and balance essential to the central magnolia theme. After speaking with Geoffrey and John, I have better insight into what makes the Magnolia House such a special place. As time goes by, and the magnolia and live oaks grow, it will only get better. A winning design, Magnolia House is an excellent example of what can happen when north meets south. Article by Randolph Stewart and Geoffrey Bay with photography by Bryan Stovall.